Le Centre Pompidou présente une production monumentale inédite de l’artiste coréenne Haegue Yang. Le Forum accueille Lingering Nous, une œuvre crée pour le Centre Pompidou, déployée sur la hauteur des trois niveaux de ce vaste espace situé au cœur du bâtiment. L’installation est librement accessible à tous jusqu’au 5 septembre 2016. Traversant plusieurs médiums, du collage à la performance, Haegue Yang interroge les qualités plastiques et émotionnelles des objets du quotidien à travers des compositions abstraites où, dissociés de leurs contextes, ils se trouvent libérés de leurs fonctions premières. Suspendue dans la cavité du Forum, Lingering Nous est une installation composée de stores vénitiens - matériau de prédilection d’Haegue Yang. De taille monumentale, constituée d’environ 166 éléments roses et verts iridescents, l’œuvre a pour particularité de comporter de nombreux stores montés en diagonale. Lingering Nous est accompagnée de quatre essais vidéo au niveau -1 du Forum, Video Trilogy (2004-2006) et Doubles and Halves – Events with Nameless Neighbors (2009). Ancrés dans les réalités intimes d’une vie contemporaine fugace, leurs récits confèrent une voix à l’installation muette, permettant tout à la fois d’apprécier la richesse de l’œuvre d’Haegue Yang. Nicolas Liucci-Goutnikov – Over the last ten years, you’ve been creating installations in which blinds, or artificial light, and movement and sometimes smell play a key role. Is this way of working intended to produce “experiences” rather than objects? 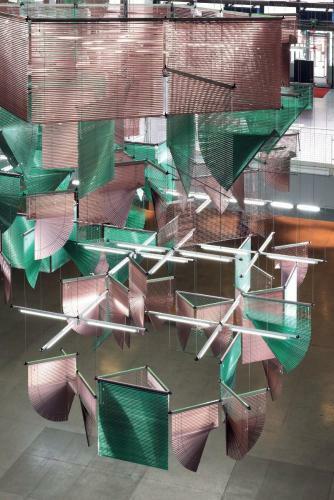 Haegue Yang – Yes and no, because the blinds don’t occupy space like ordinary objects. They are objects that organise space by virtue of their enigmatic power. In early works, such as Series of Vulnerable Arrangements – Blind Room (2006), the blinds were just zones of sensual experience, from the cold draught coming from the air conditioner to the heat from the infrared heaters. Mute but rich in effects, Blind Room also included the voice recorded in the three video “essays” of Trilogy. This voice inhabited the same space. Yearning Melancholy Red (2008) allowed me to test out by discoveries regarding “the obliquity of the blind” explored in Blind Room. There the blinds are deployed in a more evidently spatial fashion. They also tell a story through their form, their colour and the dialogue of contrasts with a moving red light. Around the structure of blinds are arranged three opposed pairs of radiators and fans. These intensify the experience of the senses. NLG – Most of your installations are made from household objects stripped of their original function. What is your relationship to these objects? HY– Materials are endowed with a magical power. I conceive of them in all their potentiality, a potentiality that is actualised only through struggle. All these years I’ve spent working so hard with blinds have proved in a way that this struggle wasn’t in vain: it enabled them to free themselves from their trivial appurtenance to the everyday. NLG – What was the problematic you confronted in this installation at the Centre Pompidou? HY – It was one that I imposed on myself, in seeking to return to an earlier form of the series of works entitled Sol LeWitt Upside Down, begun in 2014. I wanted to free myself of a strong desire I had felt then, for an installation of blinds that would explicitly cite the modular structures of Sol LeWitt. But I ended up returning to what I had tried to get rid of, completing a cycle of conceptual construction, from “learning” to “unlearning”. NLG – You developed the installation for the Forum of the Centre Pompidou while making it adaptable to exhibition galleries. How did you manage that? HY – The installation is based on a grid that has its own geometry, offering minimal resistance to transformation. As such, it can be adapted to spaces of different size and shape, giving the work the possibility of an adventurous life!